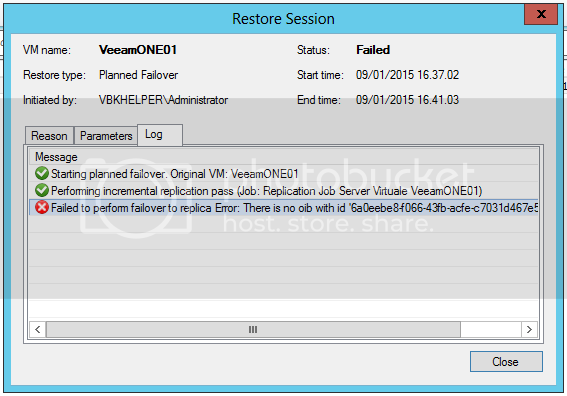 As part of a VMware vSphere 5.1 Cluster migration to new hardware for an existing Veeam B&R customer, I am testing the use of replication jobs in our lab to do that (using Veeam B&R GA version 8.0.0.817 + Patch #1). I went through support this morning in order to take a deeper look into this. During the remote session we have changed the logging level to 6 (ultimate level) and reproduced the issue, then we have collected both the log files and a backup of the Veeam Backup SQL Database. Since the Veeam B&R installation in our lab has been upgraded from previous versions to current version, this afternoon I reproduced the issue using a fresh installation of Veeam B&R (GA version 8.0.0.817 + Patch #1), however the issue persists. Any suggestions and thoughts will be greatly appreciated. I also get this issue on a 5.1 cluster, Veeam v8 patch 1. I need to try a failover on our other clusters. While you're waiting for our support team to respond and investigate the debug logs, you can failover to the DR VM manually (in case of emergency) via starting it via vSphere Client. Ok, got it. Let me check this issue with devs. first of all thank you for taking the time to reply to my question. I have been in touch with the engineers over the last couple of days and the case has now been escalated to the next tier. I will report back as soon as I hear from the next tier engineers. It appears to be a known issue for planned failover job. It can only reproduced when the number of restore points is set to 1, our dev team is already aware about it. As a workaround for now, you can adjust retention policy settings. Excellent - I'd been using Veeam replication to migrate between separate clusters and ,yes, I've had the restore points set to 1 - I shall try it with 2! When planned failover is started, it triggers 2 more runs of replication job in order to completely synchronize it with the production VM. Assuming that the job is set to keep only 1 restore point, the one that existed before you started planned failover is removed and we fail because we are not able to find it. By request of the engineer, I have increased the amount of restore points to keep 3 and everything works perfect. I have also tried to increase the amount of restore points to keep only 2 out of curiosity and everything works perfect as well. Thanks everybody for taking the time to reply to my question. Corresponding KB article has been just created. Thanks. v.Eremin wrote: Corresponding KB article has been just created. Thanks. regarding KB http://www.veeam.com/kb1997. Can be explained why the restore points need to be increased to 3 ? Will it be possible in future versions that this can be configured with 1 restore point ? Yes, currently this is a limitation, but we are planning to address this behavior in the following product updates.